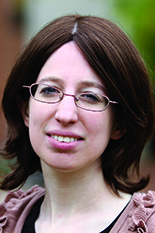 Dana Dachman-Soled, an assistant professor of electrical and computer engineering with appointments in UMIACS and the Maryland Cybersecurity Center (MC2), was named a recipient of the National Science Foundation (NSF) CAREER award. The award will provide her with $495,000 over the course of five years in support of her research. The CAREER award is the NSF’s most prestigious award in support of junior faculty. It recognizes individuals that exemplify the role of teacher-scholars through their outstanding research, excellent education, and the integration of education and research within the context of their organization’s mission. As part of her award, titled “Non-Black-Box Cryptography: Defending Against and Benefiting from Access to Code,” Dachman-Soled will explore ways to defend against non-black-box attacks, a class of cryptographic attacks that can be particularly damaging. Non-black-box attacks, also known as side-channel attacks, have been shown to be remarkably effective in breaking various implementations of encryption schemes and authentication protocols. Threat models for side-channel attacks and techniques for designing provably secure cryptosystems in these models have been limited thus far, something Dachman-Soled’s work is intended to address. Dachman-Soled is the 21st member of UMIACS to receive the NSF CAREER award. Read more about Dachman-Soled's project here.